Turn your loyal customers into an elite referral source, but offering them the ability to buy & share gift certificates with their friends & family. 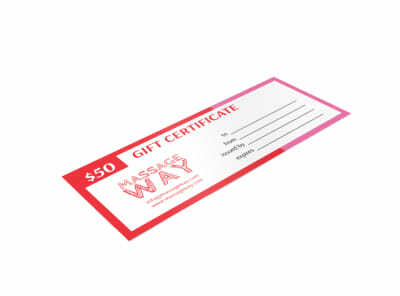 We promise that you won't find an easier way to design & print online than with our gift certificate maker. Sure, you can market your brand or business all you want, but what’s one surefire way to get people in the door? Give them a gift to get them in and to keep them coming back. It’s a two-fold approach: unlike coupons, gift certificates provide greater perceived value to customers, making them feel that they have immediate money to spend. Let MyCreativeShop help draw attention – and repeated, happy customers -- to your business or brand with our wide range of custom gift certificate designs. When to Use a Gift Certificate? There are many ways to gain the attention of your customers. But, ultimately, what motivates them to purchase your products or services and become loyal to your brand? Gift certificates can outperform other common marketing tactics because there is an incentive for the customer to use them. Bringing them into your store where the potential of having real conversations with them, as well as understanding their needs and wants can help plant the seeds of brand loyalty and allow them to grow. It’s an investment that pays off. 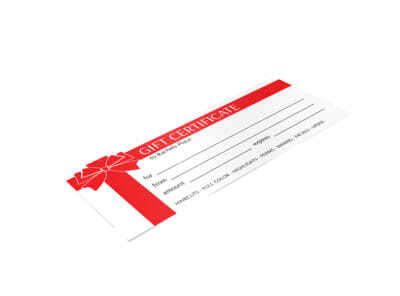 More often than not, customers spend more than your gift certificate’s denoted value. When someone buys a gift card, that’s cash in advance until the card is redeemed. That immediate spike in cash flow is a great marketing strategy that many other tactics can’t match. 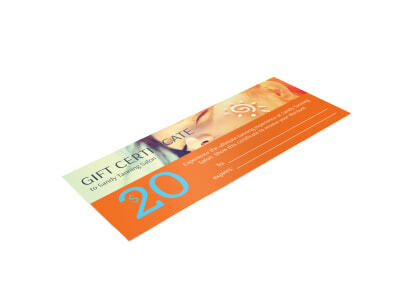 Gift certificates serve as constant reminders to customers to visit your business. Building that brand awareness can go a long way. 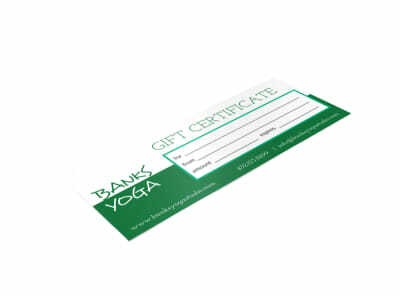 Why Make a Gift Certificate with Us? Turning potential customers into loyal buyers is vital to your business. We get that. And that’s why we want to help you grow your shopper base. Our stylish, customizable gift certificate templates can help improve marketing opportunities behind your business’ future growth. Take it from the experts. When it comes to your brand, your business, your message… there’s only one shop that’s top: MyCreativeShop.